FILE - This file aerial view taken on July 27, 2012 shows part of the city of Sansha on the island of Yongxing, also known as Woody island in the disputed Paracel chain, which China now considers part of Hainan province. Countries around the disputed South China Sea are opening tiny islets, some once tiny reefs, for tourism as a way of proving territorial claims, but the trend is expected to falter long term for lack of economic returns. In early March, a cruise ship from China took 300 people to the sea's Paracel Islands, drawing a rebuke from Vietnam, which also claims the islets. China's first cruise ship set out for the Paracel chain in 2013, and in December a Chinese airline opened charter flights from the southern city Haikou to the Paracel's biggest feature, Woody Island. Vietnamese travelers are visiting their country's holdings in the contested Spratly Island chain to stick up for its claim, said Frederick Burke, partner with the international law firm Baker & McKenzie in Ho Chi Minh City. 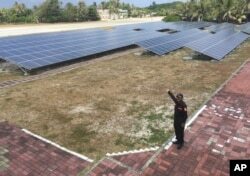 FILE - A member of the Taiwan coast guard shows the solar panels used for electrical power to visiting media on Taiping island, also known as Itu Aba, in the Spratly archipelago, roughly 1,600 kilometers (1,000 miles) south of Taiwan, March 23, 2016. "They do get some patriots to go out there once in a while," Burke said. "I suppose from a marine biology perspective some of those reefs are the fishing hatcheries for the entire sea, and I'm sure there are some interesting destinations for divers." Malaysia lets tourists visit one of its Spratly Island holdings and Taiwan has not ruled out the idea in a different part of the sea. But trips to the sea will probably attract mainly patriots and adventure seekers who don't mind long journeys, sparse infrastructure and the risk of getting caught in a conflict with some other country, analysts say. Countries may be using tourism to formalize political claims, said Christian de Guzman, vice president and senior credit officer with Moody's in Singapore. "In terms of tourism in those disputed areas, probably very little (economic benefit)," de Guzman said. "It has more of a qualitative angle to it, that formalization, but in terms of actually moving the needle in terms of contributing to the economy, very tiny." Vietnam formally invited tourists to the Spratly chain in 2015. Interest in going there "seems to be fairly eclectic and again driven by patriots," Burke said. "They do get boats to go out there to see what all the excitement is about." Malaysia has let tourists, foreign as well as domestic, visit Pulau Layang Layang in the Spratly chain, since 1989. The islet also known as Swallow Reef and used by the Malaysian navy sports a 53-room diving resort, which arranges chartered flights from Malaysian Borneo 300 kilometers away. In 2015 a Philippine military general told news media the country would develop Pagasa, one of its nine Spratly holdings, for tourists and run a ferry there from a larger, undisputed Philippine island. Chinese media said last year cruise ships would also eventually reach the Spratly chain. Brunei, Malaysia, Vietnam and the Philippines claim parts of the sea, which is prized for fisheries, marine shipping lanes and undersea reserves of oil and gas. China and Taiwan claim nearly the whole 3.5 million-square-kilometer sea. Since 2010, China has quickly expanded. It has landfilled at least 3,000 acres to equip once tiny reefs for military infrastructure. Its ships also appear regularly in waters claimed and monitored by other countries. Infrastructure, however, lags on many of the islets except to support military installations. Pulau Layang Layang is the only disputed South China Sea islet with a full-blown resort. About 200 people on Taiwan-controlled Taiping Island work mostly for the coast guard. The 1,000 people living in Sansha, a Chinese city on Woody Island, have a bank, hospital and a supermarket, though drinking water was still being shipped in as of last year. China eventually hopes to attract tourists for diving, surfing and weddings. Protection of marine life spawning grounds and coral reefs further limits travel to the tropical sea that spans from Taiwan southwest to Singapore. FILE - An aerial view of the outlying Atoll National Park of the Dongsha Islands, 150 miles (236 kilometers) southwest of the southern Taiwanese port of Kaohsiung, Taiwan, Sept. 15, 2010. Last year China barred tourism and fishing access to a rare 301-meter-deep sinkhole in the Paracel Islands, citing ecological protection. Taiwan would consider opening the sea's Pratas Islands to tourists if the government can develop a plan ensuring that visitors do not hurt sensitive marine life, said a staff person in the education section of Dongsha Atoll National Park. The park manages the the archipelago of three islets. Park officials now allow only researchers with proven qualifications to visit the three coral reefs. The coral is considered vulnerable to over-fishing and runoff from any coastal development. A year ago the coast guard stopped a Chinese ship that was harvesting coral and sea turtles near the Pratas. China also claims those islets. "We perhaps need to do some review," staffer Wang Chun-jung said. "We're now doing ecological protection work, so at the moment it's not open. We're doing the protection work there because the ecosystem is rather fragile, so we haven't opened it to common people or to the tourism industry."